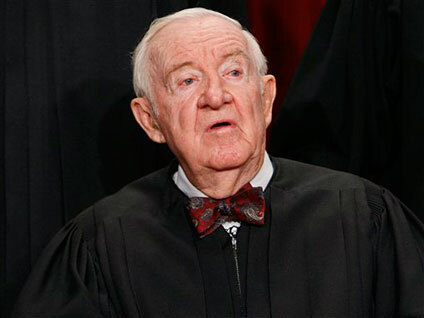 Supreme Court Justice John Paul Stevens' announcement this morning that he will retire at the end of the Court's term was a surprise only in the sense that it came today. It's been widely expected that the 89-year-old Justice would step down at the end of the Court's term this year-- the only question was when he would tell us. Stevens' legacy on the Court and the prospects to replace him. And I'll keep you updated here. In the meantime, here's a discussion Bob Schieffer and I had on Face the Nation about Stevens and possible replacements--and whether or not the White House really wants a fight after a bruising health care battle. SCHIEFFER: Well, I'm going to start with you, Jan Crawford, because suddenly, according to both the New York Times and The Washington Post today were interviews were given by Justice John Paul Stevens, who's approaching 90 years old. He's talking about when is he going to step down? I mean, there's every indication from these interviews -- he doesn't say he's going to step down, but it sounds like his retirement is imminent. So, in the midst of all the other things that are going on in this election year, it appears that President Obama is going to nominate somebody to fill a vacancy on the court. And does the White House really need or want that fight right now? CRAWFORD: Well, I think the White House has been expecting this. We've long suspected that Justice Stevens was going to step down this year, and he said he's going to retire in Obama's -- President Obama's first term. So that means either this year or next year. Justices don't like to retire during a presidential election season. They don't want to inject the court into politics. So the White House is ready for this. I mean, remember, they went through this last year when they replaced Justice Souter. They looked at these nominees. They've got a pretty good working short list. If they want a fight, now's the time to have it. They've got a solid majority in the Senate. They're going to lose, probably, four to six votes in the upcoming midterm. So if they want a fight, now's the time to have it. CRAWFORD: But the question is, do they? And I don't think they do. They don't have to have a big fight. They've got qualified nominees out there who I think would be pretty palatable to some of those -- some of the moderates. SCHIEFFER: Who would you think are the -- the leading candidates right now? CRAWFORD: There's a pretty good working short list, now, of, number one, Elena Kagan, former dean of Harvard Law School. She's the current solicitor general. She represents the United States in the Supreme Court. She's very qualified, sparkling credentials. And some conservatives really like her. She hired a lot of conservatives at Harvard Law School. You've got Merrick Garland, a judge here on the D.C. Circuit, considered a moderate on some criminal issues. He would be a very, I think, easy confirmation for the White House. But there's a lot of voices for another woman, and that points us to Judge Diane Wood on the Chicago Federal Appeals Court. She would probably be the biggest fight, because, out there in the heartland -- that's where you get a lot of those controversial abortion cases, and so she's sat on a few of those. SCHIEFFER: There was an interesting speculation that maybe Senator Amy Klobuchar of Minnesota might be on the short list, but I notice you didn't list her. CRAWFORD: Well, that's a very intriguing possibility. She's a really impressive person. She's got prosecutorial experience, and people are always clamoring for someone off the judicial monastery. This court's got all former federal appeals court judges. Even the president has talked about how the court is out of touch with everyday Americans. We saw him take a swipe at the Supreme Court in that State of the Union address. She's an impressive person as well, Yale, Harvard -- Chicago Law School. SCHIEFFER: Because the Republican governor could then appoint a Republican to take her place. CRAWFORD: Right, and the last thing you want is to lose another Democrat in the Senate when you know you're going to lose four to six coming in November.